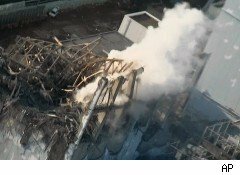 The situation with the Fukushima Daiichi nuclear plant has frayed more than a few nerves around the world, especially after food, water and seawater in Japan were found to be contaminated with radiation from the damaged reactors. But an environmental science expert at Harvard School of Public Health, Dr. Edward Maher, tells DailyFinance that the risks to Americans are very low. Maher explains that while "significantly elevated levels of airborne radiation can increase the cancer risk for all cancers, the risk is a function of the airborne concentration, exposure time and the specific radionuclides involved." DailyFinance asked Dr. Maher the questions we know you want answers to. Is there a risk to U.S. residents from air and seawater contamination? "No," says Maher, "these risks are mitigated by ... the great distance away the U.S. is from the accident site. After being dispersed and diluted by 6,000 miles of atmosphere and the mighty Pacific Ocean, respectively, neither airborne or seawater concentrations will be a threat to the U.S. mainland." The concentrations in the air and water by the time they reach the West Coast "will be indistinguishable from background radiation and will have no health impact to our citizens," he says. What are the risks of radiation-contaminated seawater, water and food? While ingesting radioactive food can cause DNA and cell damage, and possibly increase your cancer risk, Maher explains that in fact, we all do just that every day. "All seawater, soil, water and food contain trace amounts of naturally-occurring background radioactivity [from such innocuous seeming source as rocks, bricks and the sun]. It's unavoidable." Maher, who is president of the Health Physics Society, also points out that the government regulates just how high a concentration of radioactivity food and water can contain and still be considered safe. "In accidents like the one in Japan, food supplies can potentially become contaminated above these maximum concentrations, and when this occurs, the government will impound these food supplies and prevent them from entering the market." What about the risk to the U.S. consumer from imported food? "[T]he only credible risk is through consumer items brought into this country, i.e., imported food and plants," Maher acknowledges. But, "[t]he Japanese government has similar regulations and practices to the U.S. on controlling foodstuffs following a radiological or nuclear contamination event." Indeed, the Japanese Ministry of Health, Labour and Welfare has already ordered a halt to the sale of certain food products from some affected prefectures. "This will prevent contaminated foodstuffs from entering the Japanese and world markets," Maher says. "Our government will check it again as it enters the U.S."
Indeed, the U.S. Food and Drug Administration was quick to say that there is no risk to America's food supply. It banned some food imports from affected regions in Japan, and has augmented its radiation screening, among other precautionary measures. Foods from Japan, the FDA noted, make up less than 4% of all foods imported to the U.S.
Have higher-than-normal radiation levels been observed in the air, seawater, food in the U.S.? "Finding naturally-occurring radionuclides in foodstuffs is nothing new. It happens all the time," says Maher. "I haven't seen any reports of slight elevations of the Japanese plant radionuclides in this country." While the Environmental Protection Agency's detectors on the West Coast have captured trace amounts of radioactive elements consistent with those released by Japan's nuclear incident, the radiation levels detected on the filters from California and Washington monitors are "hundreds of thousands to millions of times below levels of concern." "It wouldn't be surprising if trace amounts of plant radionuclides are detected in the U.S. at some point," says Maher, "but none of them will have any consequence to the U.S. population." Thanks to the sensitivity of our modern, high-tech instrumentation, detectors can register the slightest elevation of radiation, down to the single atom level. "But that doesn't mean it has health significance. In the vast number of cases, it means nothing. It's still the 'dose that makes the poison.' "
What should U.S. consumers do to protect themselves? Consumers in America and Japan should know that their governments have been actively protecting their food and water supplies for years against all kinds of contamination: radiological, chemical and biological. "Part of that protection is periodic, mandatory and random sampling of the food and water supplies for these agents by the Food and Drug Administration or U.S. Environmental Protection Agency," Maher reassures us. "These activities go on in the background even in the absence of a credible threat or a known accident. In an accident or event situation, these agencies will step up their [monitoring activities]. The U.S. consumer doesn't need to do any more than what the government is already doing on their behalf."